I started this wallpaper long time ago, but I haven't had much time to finish it untill yesterday. Hagu's outline, her hair and skin were already done, so I "just" needed to finish the rest. This was the first time I used my tablet but just on the water, the rest was colored with the old method, using my mouse. I changed her life belt, because the life belt on the original scan seemed rather boring. 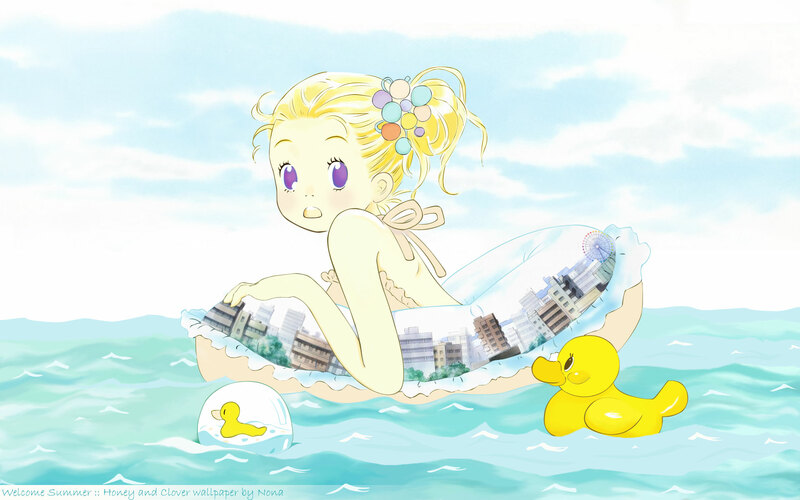 I've found a good scan of the city, and now she has the whole word of Honey and Clover under her arms xD. Thanks for Yina and Warrior for their advices. Comments, favs, etc. are welcome! Browse Honey and Clover Gallery: Recent | Popular. I need to highlight this wallie at , I really hope you join the group. well done & its a fav! It's been a long time since I last saw a H&C wallie. The bright colours, the concept, the vector are all so well-blended in! It fits so well! P/s: If you have the time, please check out Chamber of Kings. This is so cute XD why is there a rubber ducky in a bubble? This wallie deserves more favs~ ^^ thanks for sharing! WOW! Simple, clear, cool and amazing duck! Thanks for sharing!